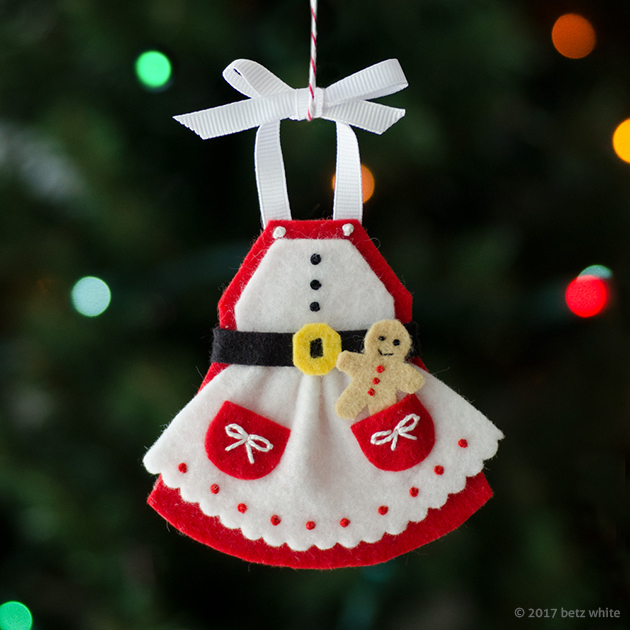 This cute little holiday apron looks like something Mrs. Claus might wear while baking Christmas cookies at the North Pole. Easy to make with felt, ribbon, glue and a few basic embroidery stitches. The skirt has a tiny it of gathering to give it dimension. The bottom edge of the skirt can be made by using scalloped “pinking shears” or by using the scalloped template provided in the pattern. If you haven’t joined the Holiday Stitch-along Ornament Club yet, you still can! The cost is $20 for all 4 ornament patterns. Three have been released already and number 4 is coming on November 27th. If you’d like to simply buy this pattern individually without joining the club, it will be available in my Etsy shop next Monday November 20th. Keep in mind the cost savings you get with the club ($5 each vs $6 each!) as well as enjoying the surprise and crafting along with other club members. If you’ve already made a few ornaments, I’d love to see them! Share on Instagram with the hashtag #holidaystitchalongornamentclub or post in our Facebook Group! Announcing the Easy Modern Apron, my new Craftsy Class! Holiday Ornament Stitch-along Club #3: Wakey Wakey Eggs and Bakey! This apron ornament is so cute I actually gasped when I scrolled down on my computer and saw the image. SO CUTE!